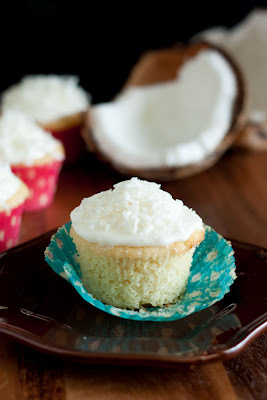 One hundred percent irresistible Coconut Cupcakes with Coconut Frosting! 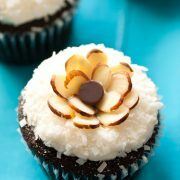 These are one of my new favorite cupcakes! I love how they don’t have pieces of the chewy coconut in them because you grind the shredded coconut in a food processor before adding it. These cupcakes are pure bliss. Everyone loved them! The frosting melts in your mouth. The cupcake recipe is one I found in the Martha Stewart Cupcakes book, but I decided to add my own frosting recipe. They are perfect together! I also like how the frosting recipe I used can be made in under 7 minutes =), it takes maybe 3. 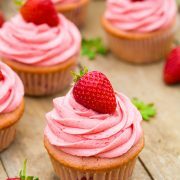 I hope you enjoy these dreamy cupcakes as much as I do! Delicious coconut infused cupcakes with a sweet creamy frosting. 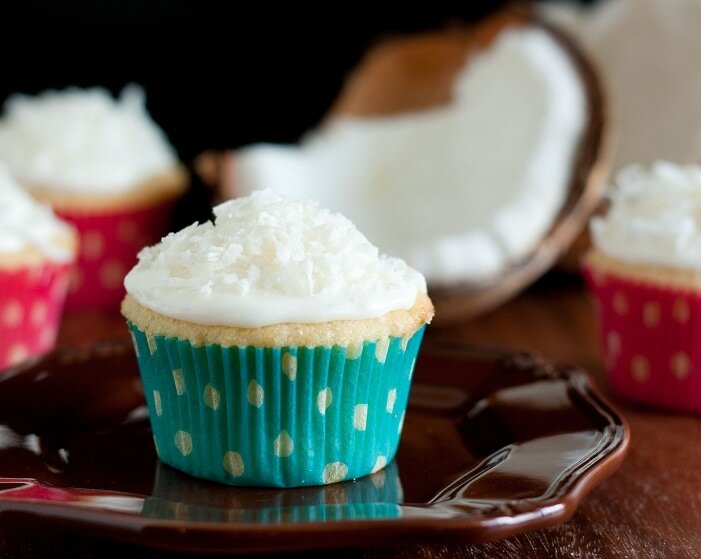 Everyone will love this tasty tropical treat! Preheat oven to 350 degrees. Pulse coconut in a food processor until finely ground. In a mixing bowl, whisk together flour, baking powder, salt and ground coconut, set aside. With an electric hand mixer on medium high speed, cream together butter and sugar until light and fluffy about 3 – 4 minutes. Add in eggs and egg whites, mixing after each addition. Stir in vanilla. With mixer on low speed, add in flour mixture alternating with coconut milk in three separate batches, mixing until combine after each addition. Divide batter evenly among 20 paper lined muffin cups, filling each cup about 2/3 full. Bake in preheated oven, rotating muffin tins once halfway through baking, until toothpick inserted in center comes out clean about 19 - 20 minutes. Allow to cool several minutes before removing from tin to cool on a wire rack. 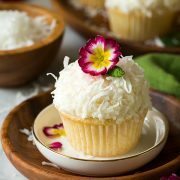 Cool completely then frost with Coconut Buttercream Frosting and garnish with additional shredded sweetened coconut if desired. Store cupcakes in an airtight container. Combine all ingredients in a large mixing bowl. Using an electric mixer, whip ingredients together until smooth and fluffy.